Gigantor was finally calibrated, and actually managed to print a range of fairly decent models, though I decided to pick up a second printer to support the changes I needed to make on it: a Printrbot Junior v2. In time that printer was sold off and then replaced with a Printrbot Simple Metal, and let me tell you: autocalibration is a wonderful thing. I’ve been working with Mcor Technologies for a bit over a year now as their Service Engineer in the Americas! It’s an interesting job, but it does require a lot of travel which eats into weeknights that could otherwise be used toward finishing off the filament switching head. That’s the extremely short version of the events between the last post and now, which leads me to where I’ll be taking this Build Log in the future. For one, it’s going to take on more of a portfolio format with large, discrete posts with images detailing the projects I’ve taken on. The first of those will be an Open Source Syringe Pump I’m fabricating for my dad’s lab back home in Miami, and that should go up most likely by the end of the month. About five months have passed since you last read about HPRINT, and in terms of the story behind it you’re about nine months behind. Time to catch up! When I arrived at Tech in August, one of the first things I did was try out the new gantry components and was pleased to find that they worked fairly well, but I would need to seriously alter the extruder carriage and pulley layout to ensure smooth operation. At around the time I was working on the CAD for that, the workload of classes hit and I was forced to put off further work on the machine until around late November. Until that time, the printer – which some Undergraduate Lab Instructors had begun referring to as Gigantor due to its titanic frame – collected a fair bit of dust. When I began to work on it again, I focused on one of the major issues everyone has to contend with building an H-gantry: skew. When an H-gantry carriage moves on any diagonal direction, unbalanced forces exist on the ends of the gantry itself, resulting in skew. This is of course a very bad thing for precise applications like 3D Printing, as it ruins positional accuracy. The only way around this is to have a structure that does not in any way permit skew, so I set about to design just that. 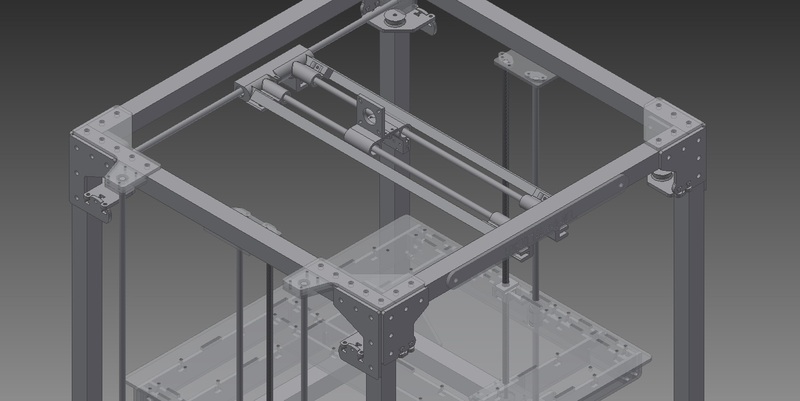 Above is a picture of the updated gantry assembly as a CAD model, one of the gantry ends, and as it existed early on in the semester. The increased length, a shift to brass bushings, and bracing using aluminum angle had a dramatic effect on overall rigidity. Unfortunately, due to the level of inaccuracy present in the consumer machines used to create the parts they were effectively unusable: slight contraction of the plastic during printing had caused them to curve just enough to bind horribly on the linear rods. It was at this stage where I decided to make the switch to a standard gantry setup, with one motor added to control the travelling X-Axis. Now that I’m free of final exams – and not a small amount of unpacking – I can write a bit again! To start, about three weeks ago this got published. 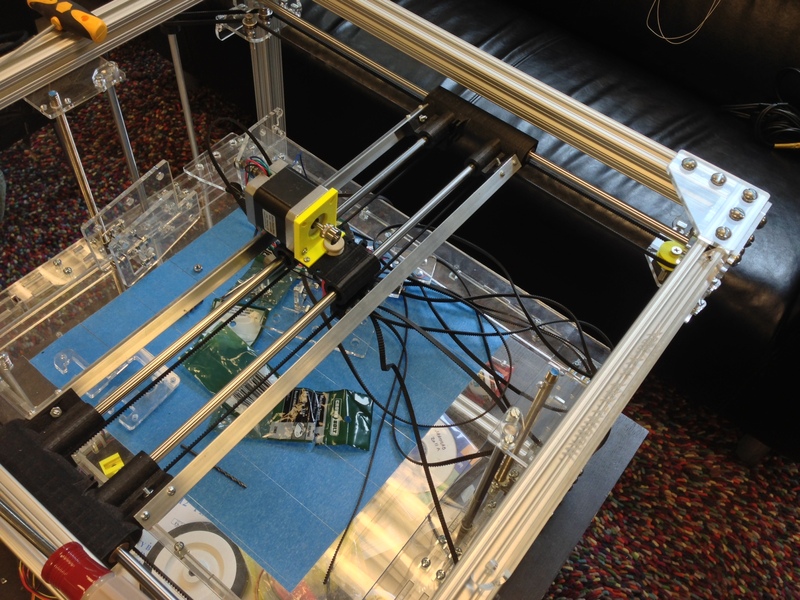 It’s the first of two pieces I was asked to do for Make’s 3D Thursday series, and I was excited to share what we’ve learned from running that many machines with such a high throughput at the Invention Studio. The second piece should be up in a few more hours, and covers a bit of a different subject. Additionally, I hope to have another big post on what I’ve been doing with the printer-formerly-known-as-HPRINT online soon. Insufficient Constraints: In some design variants mechanisms are left underconstrained and are able to move excessively, causing artifacts to occur in prints. Some machines have under constrained Z-Axis screws, while others may have under constrained X-Axis carriages and beds. Taking care to ensure sufficient constraints exist on a machine is critical to keeping undesired movement from occurring, impacting print quality. In MendelMax designs, it’s usually the Z-Axis screws that have this issue. Excessive Constraints: In other cases, MendelMax variants were made with care to avoid issues that arise from insufficient constraints and instead went too far. More than three constraining features is usually excessive for a plane, particularly if two are hard constraints with no allowance for movement and the third is able to make up the difference with a small degree of movement. This can get tricky because you can have more than three constraints, and they can all be capable of small amounts of movement or deformation individually; care must be taken to only allow this movement in certain directions which are irrelevant to the positional accuracy of an assembly. Most often, this pops up in having too many bushings, bearings, shafts, and very occasionally nuts or bolts. In MendelMax designs, this can occur in all of the above areas depending on the machine; in AO-101s, I believe some of the issue crops up most frequently in the nuts for the z-axis screws and the leveling screws for the bed. Ill-Planned Drive Systems: Many printers use very small neoprene belts for their drive systems strung over long distances with tensioners included as an afterthought, if they are included at all. This leads to a great deal more backlash than would otherwise be present in machines which could be avoided by using wider belts across shorter distances with spring tensioners, or at least printed clip-on tensioners (and if you wanted to splurge, fiber reinforced belts that don’t tend to stretch as much). Poor Material Choices: Some hot ends are made entirely of aluminum; while this is great for thermal conductivity, this is bad for both assembly and disassembly. Aluminum parts have a tendency to bind as they rub against other parts made of aluminum, sometimes badly enough that they’re impossible to separate without destroying both. Switching to materials that either bind less or more easily slip against each other can reduce this annoying occurrence. In a similar vein unrelated to MendelMax machines, anything using wood as a main structural element will change shape ever so slightly under varying humidity; this means calibration may need to occur much more frequently than machines that use metals and plastics for their structure. The Combined Effects of the Above: Let’s say you have an under constrained Z-Axis screw and shaft setup and over constrained nuts for the Z-Axis screws. This means the screws both wobble slightly as they rotate, and as a result the nuts drag the XZ-Assembly along on the XY-Plane as a result. This is going to result in worse prints than either problem individually. Add to that some stretchy belts, and the problem is magnified even more. That isn’t to say these can’t be mitigated in machines that have these problems. With a little bit of adjustment beyond the setup work already done by LulzBot on the AO-101s before shipment, we were able to almost entirely eliminate these problems with no additional parts except for a few printed tensioners. The Waterjet Room – As its name suggests it’s the room that houses our OMAX waterjet cutter, probably the crown-jewel piece of equipment the Studio operates. It also houses our three Trotek laser cutters and much of our equipment for doing light metal work. Previously it contained tools for wood working, but to extend the longevity of our other tools by reducing dust those have now been isolated to…. The Woodworking Room – Previously this was our command center called ‘The LaserLounge’, containing a single 40 watt Trotek laser cutter and our electrical equipment, with a single large table for general assembly work, a small couch and two armchairs from Ikea. Now it contains all of our hand tools, and just about every piece of equipment we possess capable of being used on wood. With the recent addition of a 4’x8′ CNC router it’s starting to get a bit cramped, but our tetris skills have thus far kept the room sufficiently open to ensure safety requirements are met. The ElectroLounge – The new command center and home to all of our electrical equipment – and the aforementioned Ikea furniture – plus a motley assortment of 3D Printers. Before we moved in we had the space renovated to improve visibility and to allow us to more easily monitor the surrounding space, including the Woodworking room. It is currently the easiest room to find thanks to a gigantic, student-made LED backlit aluminum sign installed over the main entrance doors. The Digital Design Room – This used to be one of two well-worn computer labs on this side of the building, containing somewhere in the neighborhood of 10-20 workstations. After expanding into the space, we’ve reduced that number to four dual-screen workstations with some expanded capabilities: three of them are equipped with MakerBot Replicator 2’s, and the fourth is equipped with our vinyl cutter and 3D Scanning equipment. The rest of the space is currently set up for group work with three long butcher block tables, which have been popular with Senior Design teams. A final addition of equipment to the room will be a suite of Lulzbot AO-101 printers, set up as the first Central 3D Printing Service at any university in the US. Setting up this room’s equipment has been one of my personal goals, and should serve the Georgia Tech community for many years to come. The Machining Room – Some of us call this room ‘the Danger Zone’ in jest, as it contains what are considered our most dangerous and complex tools: mills and lathes, of the manual and CNC variety. As such the room is not regularly opened except to individuals who have been properly trained to use the equipment, and when in use the person using a machine is always accompanied by at least one Undergraduate Lab Instructor. The room also contains some other equipment including a vacuum former, a small injection molding machine, a set of abrasive tumblers, a motley assortment of light prototyping tools and resin casting equipment. What most people don’t realize about the Invention Studio is that it is entirely staffed and operated by student volunteers. That’s right, there is no head machinist in charge of these spaces; the only faculty and staff involved act in a support capacity, primarily as interfaces with the rest of the school. This is the first such space of its kind at any university in the US, and possibly anywhere in the world. As such, great care is taken by the Undergraduate Lab Instructors to ensure the space remains safe and functional, and that new Undergraduate Lab Instructors who are selected are able to maintain the same high standards. This has truly been the key to the Studio’s success, allowing it to grow rapidly and yet remain flexible to the changing needs of the entire student body. However, up until the publication of that video it’s been a bit of an up-hill battle for the Invention Studio to be noticed by the public at large. That changed in a big way when Dale Dougherty, founding editor & publisher of Make magazine, wrote this post. Here’s to hoping for more of the same in the near future! For the past year and a half or so, I’ve been working on designing [and in the past several months, building] a personal 3D printer along the lines of the more popular consumer and open-source models on the market. But before I get into the current state of the project, I’d like to show you how I got there. All in all, a solid not-quite-first effort from MakerBot Industries that used a build surface that moved on the XY plane, with the extruder head moving on Z. While this is a bit backwards as far as printers go, extruders at the time were very large and the relative size of the prints didn’t result in odd effects from changing plate inertia during a long build. 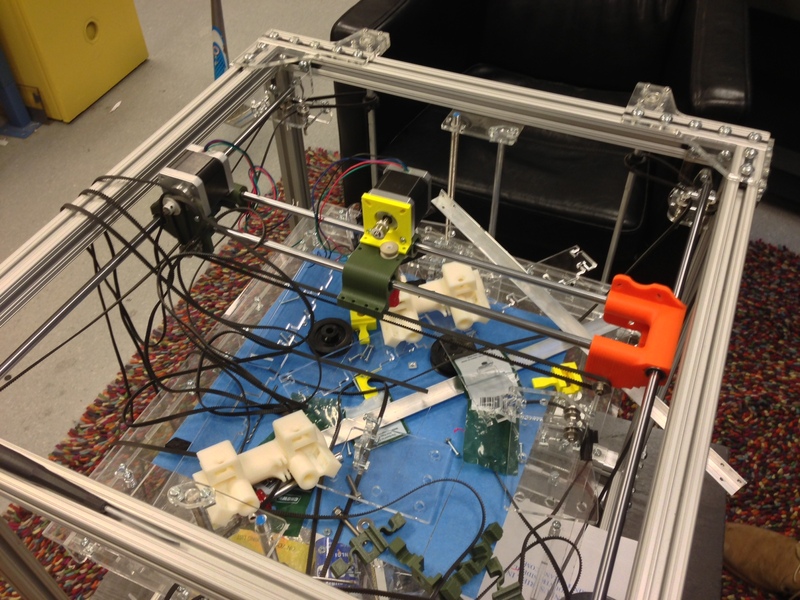 The original open source 3D printer project focused on making a printer that could print as much of itself as possible. There were a few designs to pick from at the time, but most seemed a bit too hacked together for my tastes. Released right around the time I started looking into designing my printer, I was immediately drawn in by its rapid print speed and large print volume. Using the Ultimaker as a starting point, I began to work on a frame design. I knew I did not want to use wood; while it is a cheap and fairly robust material for such a project, it is well known that wood distorts due to changes in water content/humidity. Since 3D printers need to remain very finely calibrated to produce good prints, making a printer out of a material which changes dimensions because of the weather is a bad idea. Initially, I shied away from using 80/20 in favor of metal or plastic corner blocks and aluminum tubing. Eventually, I came to find that using that approach would vastly over complicate fabricating the printer and I switched to using one inch 80/20 as the basis of its structural framework. At the same time, my investigation of the Ultimaker turned up details behind the Bowden Extruder it uses to feed plastic filament into its heated nozzle. Bowden Extruders were developed to reduce gantry weight on 3D printers, allowing for faster head movement and less backlash; the extruder drive sits mounted to the printer’s frame, while only the nozzle rides on the gantry. 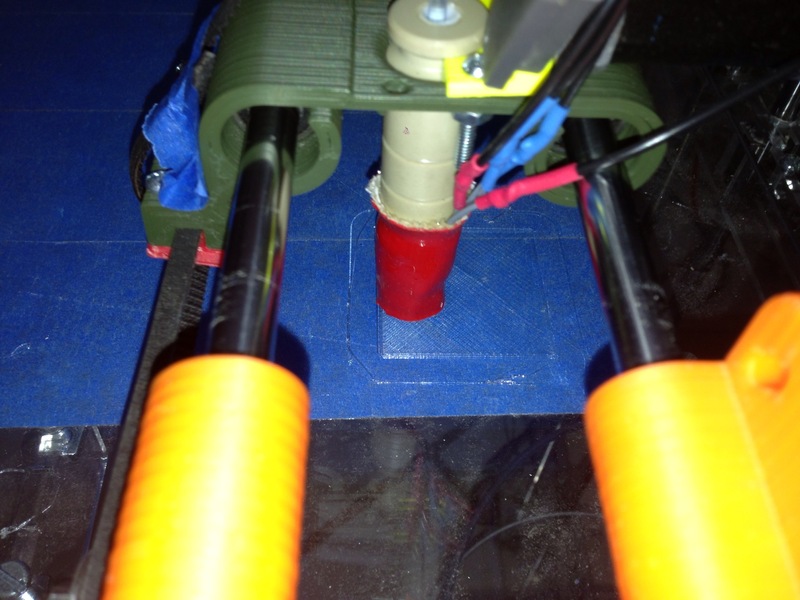 However, due to the need for a guide tube to ensure the filament is driven into the nozzle a new problem arises. Depending on where the gantry is positioned above the print area, the filament experiences forces from this guide tube that effect how fast it enters the nozzle. This results in inconsistent extrusion rates from one point on the printer to the next, and would require in-depth experimentation and analysis to compensate for. 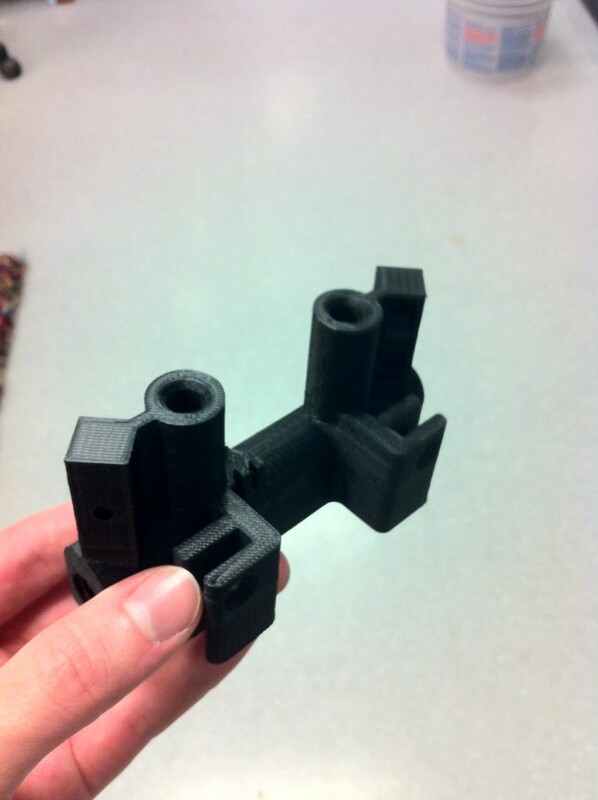 For this reason, I elected to use the recently released MakerBot Stepstruder MK6 as the basis of my printer’s extruder. I was – and still am – interested in possibly making costume and prop parts using the printer. Being able to print large objects would simplify some of those projects. Simple enough to explain, less maintenance time is always a good thing. Plus, that would also mean the prints retain a uniform level of quality across time. To get any print done in a reasonable amount of time with the build volume I had in mind absolutely required higher print speeds. I’d prefer a max-size print to take about 24-36 hours, tops. Maybe not as good as a Dimension machine, but without any webs of oozed plastic criss-crossing the area between parts and minimal backlash related deformations. self-explanatory: I’m a college student, I can’t drop vast sums of money on projects without eliminating something else from my budget. Three guesses which one of these flew out the window the fastest coughpricetargetcough. After wrestling for about a few months trying to design a printer of this size to meet that cost, I determined that the only way to meet $1000 would be to reduce print volume. Since I valued volume over a few hundred more dollars in cost, I elected to keep the cubic foot volume target and eat the added expense. 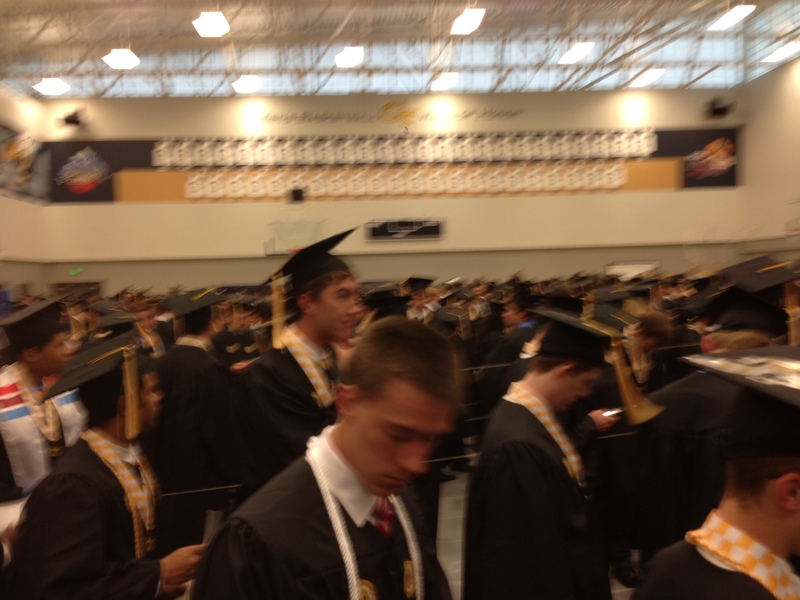 Right around this point, around Fall 2011 through the first half of Spring 2012, I hit a long period of having no time for anything but classes. As the spring semester progressed, I realized that my best chance to get the printer project made was to make parts at Tech and then assemble the printer during the summer. Unfortunately, I ended up only having enough time to finalize the 80/20 structure: a nearly cube-shaped arrangement that pieces of laser cut acrylic sheet comprising the finer structures would be mounted to. Very close to the end of the semester each piece of extrusion was cut to length, and a set of four of these were tapped for 1/4″-20 bolts. This is the final model as of when the order was made for the laser cut plates. You may notice a mysterious obscured blob where there should be an extruder carriage, which is due to the fact that this model included the early version of a new kind of filament switching mechanism. 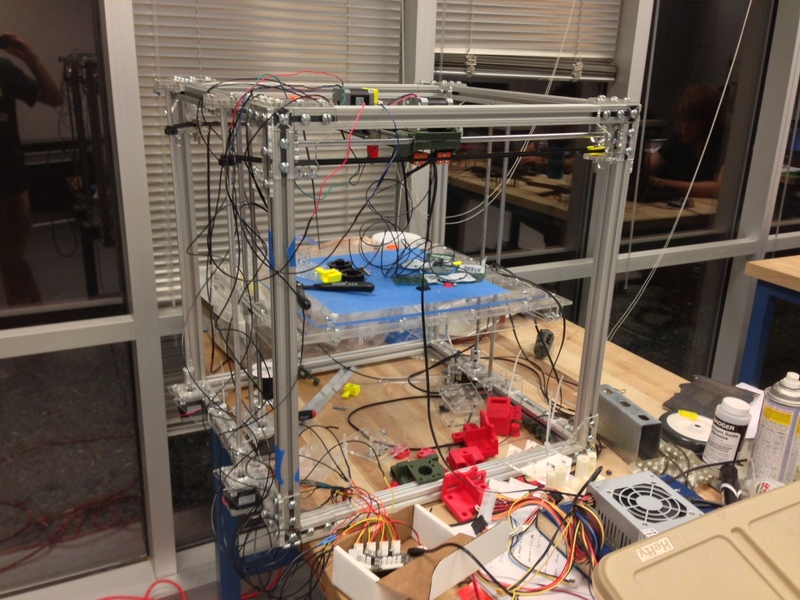 In reality, this is the primary purpose of this project: a test platform for an extruder capable of using any number of input filaments, using only a single stepper motor. I’m afraid you’ll have to wait a little to see how that turns out. After about a week or so, I received an enormous box of laser cut acrylic parts. I had discovered that with some incredible contortions of my existing belt and idler setup, I could make what may be the most MacGuyvered H-Bot drive ever. H-Bots are kind of weird: they use a single belt or length of belting attached to two drive motors to move a gantry head on two axes. They’re kind of trippy to watch at first. But, lo and behold, it worked. I promptly made a modified gantry end file more appropriate to the new H-Bot pulley setup to 3D print in the Invention Studio once I arrived, and began the drive to Tech. I’m Jeff. I currently attend Georgia Tech as a Mechanical Engineering undergrad, and I’ve always enjoyed the challenge of making new things. Most of my personal projects are mechanical in nature, though a few have heavy electrical work as well. I also do a fair bit of cooking, and I’ve been known to make some overly complex recipes from time to time. I volunteer several hours a week at the Georgia Tech Invention Studio, a one-of-a-kind interdisciplinary work space which is open to all current students at Georgia Tech as well as its faculty and research staff. As an ULI [Undergraudate Lab Instructor] and officer of the Makers Club, we provide the resources students need to complete their projects be they for a course or as personal endeavors. The purpose of this site is to serve as a record of my personal work, a guide for people undertaking similar projects, and a source of inspiration for people to take up the hobby of making things.